Noted fly fishers, authors and celebrities who have stayed at London Lakes include Jack Dennis, John Randolph, Gary Borger, Jason Borger, Gary Lafontaine, Mike Lawson, Doug Swisher, John Barrett (Fly Fishing the World, ESPN 1) and Greg Lamond, three times Tour de France winner. 8’6” to 9’ #5 preferred. Double tapered #5 or #6 are preferred for both dry fly and wet fly angling. A #6 intermediate sinking line can be included. Reels capable of comfortably holding seventy-five yards of twenty-pound dacron backing and the required fly line are recommended. This is often a reel larger than the manufacturer's recommendation. Tapered leaders with 2X, 3X, 4X and 5X tippets are preferred. Cortland Precision II and III leaders are ideal. Some North American flies such as Adams, Royal Wulff, Madam X and humpy work well in Tasmania. However, there is wide range of local patterns available at the Lodge. Copies of the new book, “Australia’s Best Trout Flies,” sponsored by Fly Fish Australia, are available upon request for $39.95 AuD, plus postage, for the enthusiast wanting to tie his own patterns prior to arrival. Felt-soled waders are not recommended for Tasmania. A ripple-soled, solid boot is preferable. Chest waders are necessary. The Lodge has a full range of waders for guests’ use. Tasmanian waters are free of all trout diseases. Visitors, particularly those from the United States and New Zealand, are requested to ensure wading boots are thoroughly disinfected prior to arrival in Tasmania. Apart from the usual accessories, the following are most important. A wide-brimmed fishing hat for polaroiding – neutral colours and definitely not white. A pair of quality polarised lenses, preferably amber in colour. Suntan lotion and lip balm. Insect repellent. 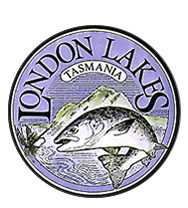 London Lakes, and Tasmania generally, has only minimal mosquito population in November and December. These are not a problem. Warm underwear and woollen socks are necessities. Rain jackets, angling vests and waders can be borrowed at the Lodge thereby minimising luggage and allowing more space for purchases.